The photographs in this tutorial are provided by a fellow enthusiast and customer who placed the prototype GS-0005 tool through the paces on several builds. 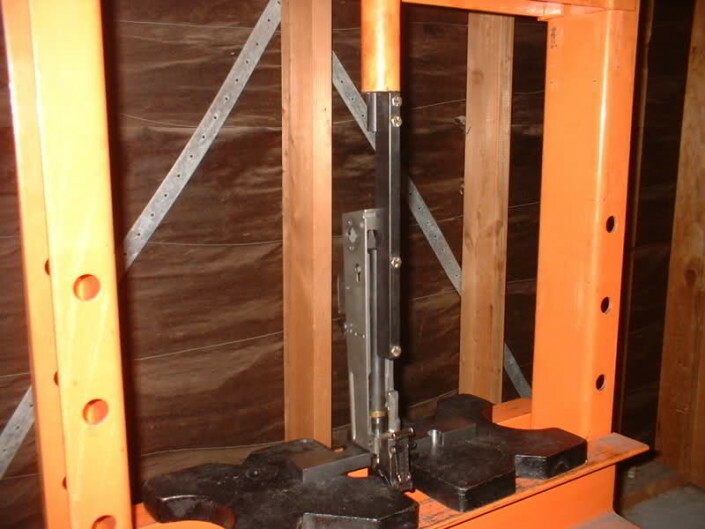 Since this first tool was designed and built it has gone through eight (08) revisions in order to allow it to cover all of the Kalashnikova types and be made stronger due to its increased length. This particular M72 is a custom built on a milled underfolder receiver, but the tool is designed to work with all milled and stamped receivers. In this example the GS-0005 is equipped with the GS-0005-D1 bronze shoe and is being used to push back the barrel to correct the headspace. As you can see; the application is very simple for the task needed as the tool slips in and aligns itself. The best method of use is to place the bronze shoe on the chamber face, and then slide the spindle of the GS-0005 onto to it. You can also see one of my press plates – probably the GS-0003-A – being used to support the front of the breech area.